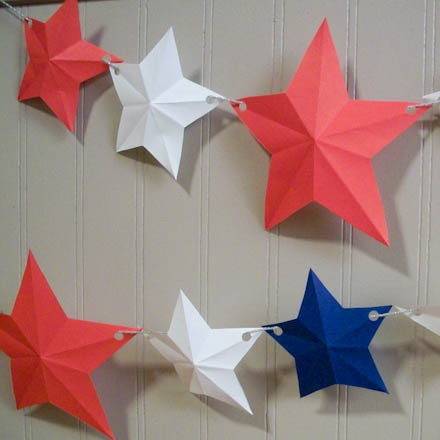 Make paper stars in red, white and blue, then string them together to make a garland for Memorial Day, Flag Day or the Fourth of July. Simply use different colors of paper to make star decorations for Christmas or other holidays. This project is great for family, classroom or group craft time. It requires no patterns and uses simple materials. With a little preparation by the adults or teen leaders, this project is fast and fun. Related craft: Make a Stars and Stripes Pennant Banner with five-pointed stars or for really quick decorations make Chinese Paper Lanterns. 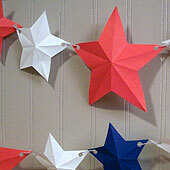 Precut paper blanks for the stars in equal amounts of red, white and blue. Each star is cut from a rectangle that is 4" by 5" or 6" by 7½". For best results, the blanks need to have straight sides and square corners. The sizes can vary a bit. If you want larger or smaller stars, just keep similar proportions—an 8" by 10" rectangle works well for a large star. Fold the rectangle in half, matching the short sides. Find the center of the left side by folding in half again and making a short pinch crease. Unfold. With the fold at the bottom, bring the lower right corner to the center of the left side (marked with the pinch crease) and crease. Fold the lower left corner up and crease along the folded edge above it. A triangle shape will be on top. Fold again, matching the folded edge of the triangle to the right side. The narrow tip of the folded paper is the center of the star. Cut the folded paper on an angled line from the left edge to the right edge—see the illustration. Unfold the triangle that was cut off to reveal the star. Vary the angle of the cut line to change the thickness of the star points. Punch holes in two opposite points of each star. Cut a length of yarn long enough for the number of stars and where it will be hung—usually 4 to 6 feet (1 to 2 meters.) Weave the yarn through the punched holes on the stars (children may need help here). A blunt yarn needle can make the job go faster. Hang the garland using tape, tacks or whatever hanging material is appropriate for the surface being decorated. 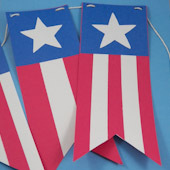 Related project: For more red, white and blue decorating, make a Stars and Stripes Pennant Banner. Tip: Another decorating option is a flag banner. 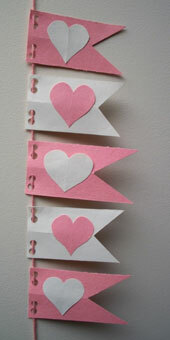 The Valentine Flag Banner can be made in patriotic colors with stars in place of the hearts. 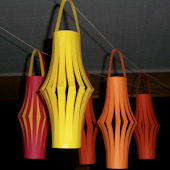 Tip: You might also make several Chinese Paper Lanterns to coordinate with your party's color scheme.